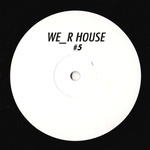 Alessio Viggiano steps up to deliver the fifth release on the We_R_House imprint, comprising four swinging house grooves from the rising Italian artist. "Swing Frequency" leads, as the name would suggest embracing a heavily swung feel rhythmically alongside modulating synths and swirling pads. "Crispy Nuts" follows with robust drums, bumpy bass stabs and an amalgamation of intricately programmed synth shots. "Slam Dunk" opens the B side next with skippy drums, airy chords, and resonant bleeps ebbing-and-flowing within before "Atomizer" closes, laying focus on swinging snares, rides and Rhodes alongside a snaking bass groove to keep things moving.